Submitted 1 year 4 months ago by aju217. In 2017, on the corner of East Third and Adams street, you would notice a strip mall that includes a Rite Aid, a laundromat, a restaurant, and a tanning salon. However, this structure has not always been there. In the 1870s the “Wigwam” was a one-story building that served as a political gathering spot before turning into a market. The picture to the right was found in the Semi-Centennial Souvenir History 1865-1915 of the Borough of South Bethlehem, PA.
A Bethlehem Press history article from 2016 stated, “In 1872, [Horace] Greeley supporters held presidential campaign meetings in “The Wigwam,” a 40-by-115-foot, one-story wooden frame structure, which they constructed on the corner lot flanked by E. Third, Birch (now Adams) and Mechanic Sts. in South Bethlehem” (1). When there was no longer a need for the Wigwam, it was sold in 1874 at auction for $150. Those who bought the building were a part of the South Bethlehem Market Company and renamed the “Wigwam” the Market House. The Bethlehem Press article mentions, “Open early on Tuesday, Thursday and Saturday mornings, the first Market House featured a middle aisle paved in brick that ran the length of the building from E. Third to Mechanic Sts. Farmers and vendors drove off the streets and parked alongside the Market House, where their horse-drawn wagons were unloaded. Exterior doors gave them access to stands in partitioned stalls, where they sold meats, poultry and fresh produce” (1). In 1878, the Borough of South Bethlehem leased the building from the South Bethlehem Market Company and in 1881 bought the building for $1000. 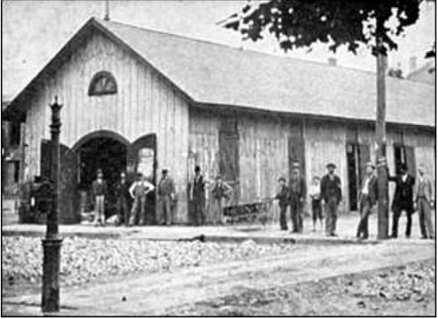 Eventually the Borough bought the Market House and began to regulate garbage, weights, and measures in order to assure customers were treated fairly. As population increased, there was a demand for a larger market. In 1890, the old wooden Market House was razed and the adjoining lot was purchased. On the first floor, the walls of the Market room were covered with white ceramic tiles. Electric light fixtures suspended from the ceiling and tall, wide arched windows illuminated the 136 stalls, rented semi-annually. This brought the Borough $5,000 in revenue. The second floor contained offices, including that of the mayor, the police station and borough officials; the third floor was set aside for use by the public for meetings. The stone basement contained the lock-up (jail) and the boiler room. In all, the new structure offered vendors, patrons and office workers modern electric service, radiant heat, hot and cold running water and public rest rooms (1). This market was known by many residents of South Bethlehem and included multiple vendors. South Bethlehem native Carol Henn blogged, “I remember almost every inch of the Municipal Market at Third and Adams St. I can still picture Rich’s Produce stand, Peter Heinrich’s Sausages, and Joe Phillips’s Meats. The Bethlehem Police Department was crowded into the second floor space above the Market” (2). After many years of service, by the 1960s the lower floors became vacant and neglected, probably a victim of shopper preferences for modern grocery stores, and the police department was moved to the new City Center on Church Street on the North side of Bethlehem. The vacant building was razed, leaving only a large empty lot on that corner, for more than a decade. After one proposal in 1989 to build a mall-like shopping and entertainment center, the current strip mall was designed and built on the Market House site by the mid-1990s. 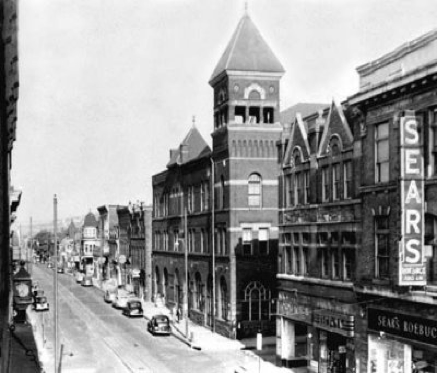 Even though one might not notice it today, the location on the corner of east 3rd and Adams street played a significant part in the rich history of South Bethlehem. 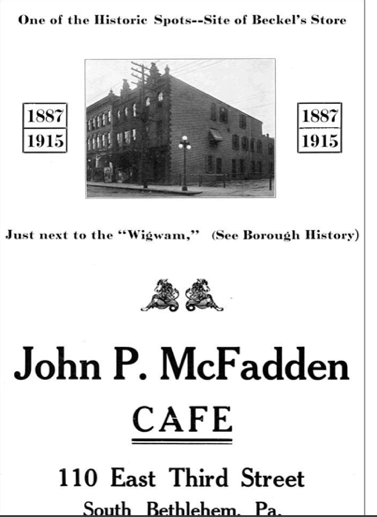 Original “Wigwam” structure found in the 1915 publication, The Semi-Centennial Souvenir History 1865-1915 of the Borough of South Bethlehem, PA. p.19. In 2017, on the corner of East Third and Adams street, you would notice a strip mall that includes a Rite Aid, a laundromat, a restaurant, and a tanning salon.